A gobo projector can be an excellent way to add a professional touch to any event. Because they’ll let you project a wide array of different colors and patterns, they can serve in place of multiple other light fixtures, especially if you invest in full-color gobos. There are such a wide variety of options out there, though, that it can be a bit overwhelming if you’re looking for the best gobo projector for weddings—especially since not every wedding is going to have the same needs. We’ve picked out our three top choices for gobo projectors, including something at every price point. Check out the full reviews below to get you started on your search. We’re going to start off our reviews with this beauty, a 15-watt LED Gobo projector from Instagbo that’s absolutely ideal for DJs and events planners. It lets you easily add that extra, customized touch to your lighting design, in a compact and durable casing that will serve you well for years to come. Let’s start with what’s going on inside this projector. It has an integrated LED chip that gives you up to 30,000 hours of use before it needs to be replaced. The bulb is plenty bright enough to be seen in any environment, and the lens is designed to give you a clear, high-definition image. It’s also built to resist high temperatures so it won’t be damaged from continuous use. It’s designed for use with customized glass and film gobos—you’ll get one single-color plate free with the projector, and can order multi-color plates from the company, using whatever image you want to have projected. The outside of this projector is built with the same care and attention to detail as the interior. The aluminum housing resists rust so you can use it for outdoor events without a worry. It’s built for durability, with an improved fan design and a sturdy adjustable stand. It has a projection range of up to 23 feet (up to 10 feet in bright conditions), and can be mounted easily to walls or ceilings as needed. Overall, it’s maybe the most versatile gobo projector on the market, and a great choice for weddings, parties, and other similar events. Chauvet DJ makes pretty much all the equipment a DJ needs to put on a great show, and that includes lighting equipment, like this LED gobo projector. It’s arguably the best gobo projector for weddings because of its portability and versatility, and it comes with an array of useful accessories that make it an even better value. The base on this gobo projector has powerful magnets built right in. This means you can affix it to any metal surface quickly and easily, without the need for clamps or other mounting hardware. 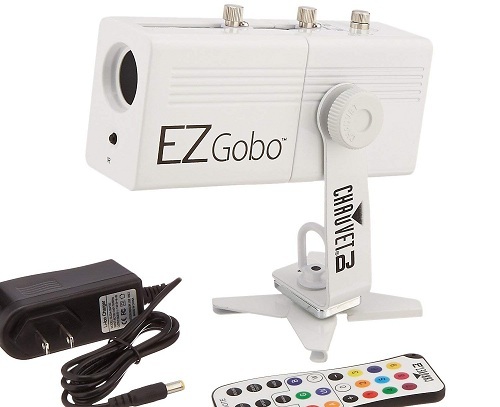 It also has a rechargeable battery built right in, making it one of the most portable gobo projectors that you’ll find. The manual zoom is another nice feature, giving you both a short-throw and a long-throw option for the image and giving you more versatility in regards to projector placement. This uses a smaller gobo than a lot of other projectors, and this can make it a bit trickier to work with. On the flip side, it’s a lot more affordable to get a variety of images to use with this projector. Not only does it come with an assortment of pre-made gobos, you can also easily design and print your own. While this projector isn’t the cheapest on the list, the ability to make your own gobos lowers your long-term costs, and it will last a lot longer than most cheaper projectors, too. (>>> Related guide about best cheap projectors) Its portability and versatility make it the ideal option for wedding planners who need to work with a variety of venues, while the easy set-up makes it just as usable for newcomers and hobbyists. Finally, let’s look at this projector from SUNY. Like the Chauvet above it’s designed for use by DJs, although it’s a great choice for anyone who organizes or performs at weddings. At less than a hundred bucks it’s also the most affordable option on the list, making it ideal if you’re shopping on a budget. You’ll be especially amazed by the low price once you see how many features it offers. This projector comes with a pre-set collection of gobos—20 in all, which can be combined to create 80 different patterns in RGB color. While this doesn’t give you as many customization options as more expensive models, it also means an easier set-up since there’s no need to mess with the gobos themselves. This is another very portable option, as well. The casing is metal but it’s still light-weight and fairly compact, so you can transport it easily between gigs and events. The fan can be a bit on the loud side, but not enough to be obtrusive and it does an excellent job of keeping the interior cool even during extended use. 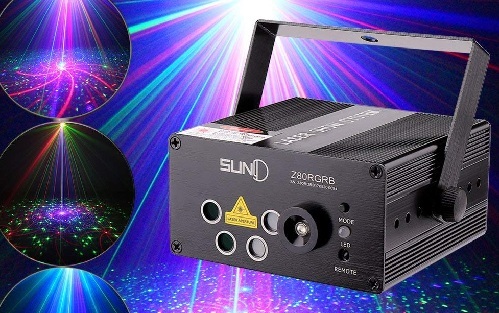 If you want an affordable, versatile gobo projector, this model is definitely worth a look. 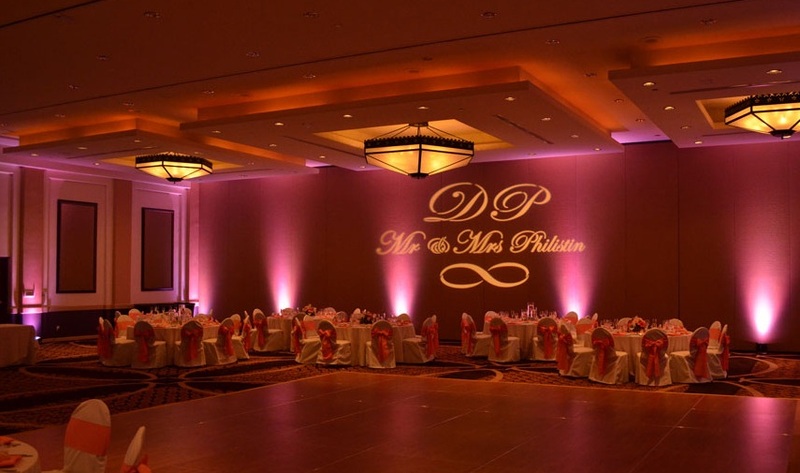 How do I choose the best gobo projector for weddings? The right choice really comes down to two factors: how much control you want over the gobos and the environments where you plan to use the projector. If you just want it for an accent light at indoor venues, something like the SUNY projector will fit the bill at a lower cost than your other options. If you want the choice of customizing the gobos, though, or if you need something bright enough for outdoor use, you should expect to spend a little more. Whatever your needs, all three of the models above are durable, dependable options that will serve you well for years to come. Previous articleGray vs White Projector Screen: Which One’s Right for You?